In the 1970s, an Indian mystic named Bhagwan Shree Rajneesh (also known as Osho) founded his own religious group with ashrams in India and the United States. 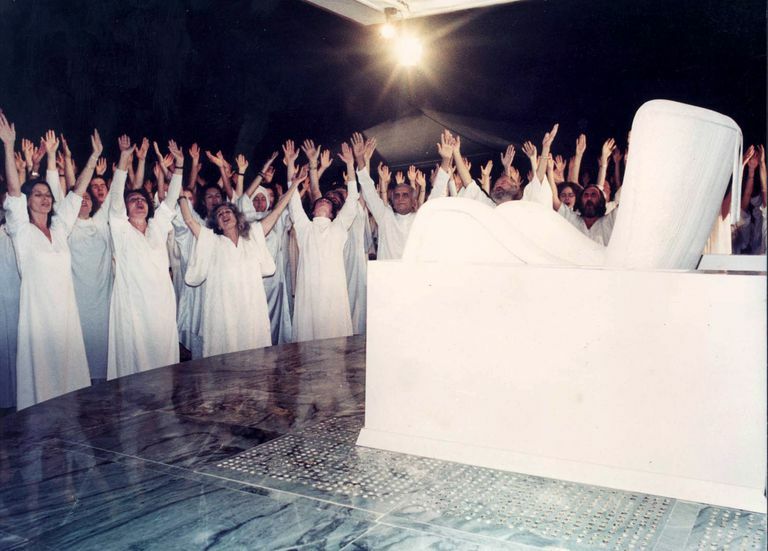 The sect became known as the Rajneesh movement and was at the center of numerous political controversies. Conflicts between Rajneesh and law enforcement escalated, finally culminating in a bioterror attack and several arrests. Born Chandra Mohan Jain in 1931 in India, Rajneesh studied philosophy and spent the early part of his adult life traveling around his home country, speaking about mysticism and eastern spirituality. He worked as a philosophy lecturer at Jabalpur University and, in the 1960s, became a bit of a controversial figure thanks to his extensive criticism of Mahatma Gandhi. He was also opposed to the idea of state-sanctioned marriage, which he saw as oppressive to women; instead, he advocated for free love. He eventually found wealthy investors to fund a series of meditation retreats, and he left his position as a university professor. He began initiating followers, whom he called neo-sannyasins. This term was based on a Hindu philosophy of asceticism, in which practitioners renounced their worldly goods and possessions in order to ascend to the next ashrama, or spiritual life stage. The disciples dressed in ochre-dyed robes and changed their names. Jain formally changed his own name from Chandra Jain to Bhagwan Shree Rajneesh. In the early 1970s, Rajneesh had nearly 4,000 initiated sannyasins in India. He founded an ashram in the city of Pune, or Poona, and began to expand his following around the globe. In the early seventies, Rajneesh wrote a manifesto that outlined basic principles for his sannyasins and followers, who called themselves Rajneeshees. Based upon principles of joyful affirmation, Rajneesh believed that that each person could find their own way to spiritual enlightenment. His plan was to form intentional communities around the world, where people could practice meditation and achieve spiritual growth. He believed that a communal, pastoral, and spiritual way of life would eventually replace the secular mindset of the world’s towns and large cities. Because of his disapproval of the institution of marriage, Rajneesh encouraged his followers to forgo marriage ceremonies and simply live together under the principles of free love. He also discouraged reproduction, and supported the use of contraception and abortion to prevent children from being born in his communes. During the seventies, the Rajneesh movement amassed a phenomenal amount of wealth by way of numerous business enterprises. Operating like a corporation, with corporate principles in place, Rajneesh owned dozens of businesses, both large and small, around the world. Some were spiritual in nature, such as yoga and meditation centers. Others were more secular, like industrial cleaning companies. In 1981, Rajneesh and his followers purchased a massive compound in Antelope, Oregon. He and over 2,000 of his disciples settled on the 63,000-acre ranch property and continued to generate income. Shell corporations were created to shuffle money around, but the three main branches of holdings were the Rajneesh Foundation International (RFI); the Rajneesh Investment Corporation (RIC), and the Rajneesh Neo-Sannyasin International Commune (RNSIC). All of these were managed under an umbrella organization called Rajneesh Services International Ltd. The Oregon property, which Rajneesh named Rajneeshpuram, became the center of the movement and its business operations. In addition to the millions of dollars the group generated every year through various investments and holdings, Rajneesh also had a fondness for Rolls Royces. It is estimated that he owned nearly one hundred of the cars. According to reports, he loved the symbolism of wealth that Rolls Royce presented. In 1984, conflict escalated between Rajneesh and his neighbors in the town of The Dalles, Oregon, which had an upcoming election. Rajneesh and his disciples had put together a block of candidates, and they decided to incapacitate the city’s voting population on Election Day. From August 29 to October 10, Rajneeshees deliberately used salmonella cultures to contaminate the salad bars at nearly a dozen local restaurants. Although there were no fatalities from the attack, over seven hundred residents fell ill. Forty-five people were hospitalized, including an infant and an 87-year-old man. Local residents suspected that Rajneesh’s people were behind the attack, and turned out in droves to vote, effectively preventing any Rajneesh’s candidates from winning in the election. A federal investigation revealed that there had been a good deal of experimentation at Rajneeshpuram with bacteria and poisonous chemicals. Sheela Silverman and Diane Yvonne Onang, called Ma Anand Sheela and Ma Anand Puja in the ashram, were found to be the main planners of the attack. Nearly everyone interviewed at the ashram said that Bhagwan Rajneesh knew about Sheela and Puja’s activities. In October 1985, Rajneesh left Oregon and flew to North Carolina, where he was arrested. Although he was never charged with crimes relating to the bioterrorism attack in The Dalles, he was convicted of three dozen counts of immigration violations. He entered an Alford plea and was deported. The day after Rajneesh's arrest, Silverman and Onang were arrested in West Germany and extradited to the United States in February 1986. The two women entered Alford pleas and were sentenced to prison. Both were released early for good behavior after twenty-nine months. More than twenty countries denied Rajneesh entry after his deportation; he finally returned to Pune in 1987, where he revived his Indian ashram. His health beginning to fail, Rajneesh claimed he had been poisoned by American authorities while he was in prison, as retaliation for the bioterror attack in Oregon. Bhagwan Shree Rajneesh died of heart failure in his ashram in Pune in January 1990. Today, the Rajneesh group operates out of an ashram in Pune, and often relies on the internet to introduce their beliefs and principles to potential new converts. Breaking the Spell: My Life as a Rajneeshee and the Long Journey Back to Freedom, released in 2009, details author Catherine Jane Stork's life as part of the Rajneesh movement. Stork wrote that her children were sexually abused while she lived on the Oregon commune and that she was involved in a plot to kill Rajneesh's doctor. In March 2018, Wild Wild Country, a six-part documentary series about the Rajneesh cult, premiered on Netflix, bringing more widespread awareness of the Rajneesh cult. Bhagwan Shree Rajneesh accumulated thousands of followers around the globe. He settled in ashrams in Pune, India, and the United States. Rajneesh's followers called themselves Rajneeshees. They renounced worldly possessions, dressed in ochre-dyed robes, and changed their names. The Rajneesh movement amassed millions of dollars in assets, including shell corporations and nearly a hundred Rolls Royces. Following a bioterrorism attack perpetrated by group leaders in Oregon, Rajneesh and several of his followers were charged with federal crimes.